When selecting your laminate top for the kitchen area of your home there are many styles and colors to choose from. In my twenty seven years of making kitchen countertops the most popular designs and colors are determined by the current trends. For instance, in the nineteen eighties one of the most requested countertop patterns was the Sand Stone look. This Wilsonart laminate selection combined with a wooden edged countertop was very popular during that time. Like everything else, new edge profiles continue to emerge and so do new colors and patterns. For the past ten years, until now in 2011, granite has certainly dominated the kitchen design industry for countertop selections. Since not everyone can afford the high costs associated with installing real marble kitchen counters, fabricators of plastic laminate began to design really accurate simulations of the stone patterns. I am a professional countertop fabricator. This article will teach you how to build a Formica laminate countertop for your kitchen or bathroom. The tutorial video below demonstrates the process of adhering the decking perfectly. If you want to add a beveled edge to your Formica top, the video below will teach you how as well. Concrete is the new unique trend hitting the kitchen design industry? It is being used for kitchen and bathroom countertop designs in many high-end homes. 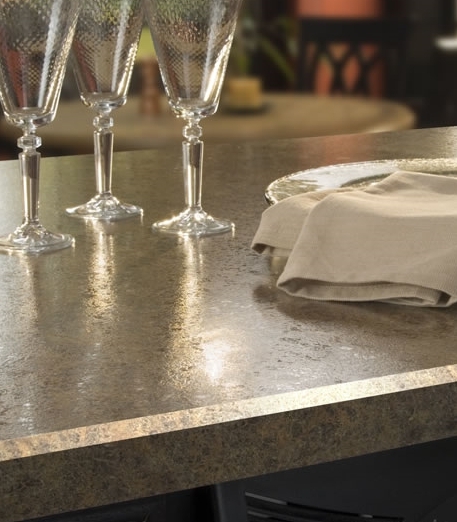 The video below tells the facts about using concrete for countertops. Popular design trends spread like wild fire. Once enough homeowners like a trendy item, practically every home or business in America has a touch of it. You’d have to be camping out under a boulder not to notice that marble is at every turn. It seems like everyone either wants or has a designer marble top. For our benifit, this is not the case with cement counters, not just yet anyway.